How Much Weight Can You Lose Riding a Stationary Bike? Whether your goal is to lose just a couple pounds or your doctor has advised you to lose 100 pounds, the stationary bike can be your ticket to success. This form of exercise, coupled with a low-calorie diet, can help you lose a good amount of weight, depending on how much you have to lose. Losing weight depends on your ability to burn off excess fat deposits throughout your body. Weight loss can be fleeting, but the physiological process required to burn fat and lose weight is basic. When you consume fewer calories than you burn, your body enters a phase known as a caloric deficit. This phase directly leads to fat loss, and if you wish to lose weight over time, you must keep your body in this deficit. Reaching a caloric deficit of 3,500 calories leads to the loss of a pound of fat, and this goal is reasonable to attempt weekly. A stationary bike can help you burn enough calories to place your body in a caloric deficit. Riding a stationary bike with light effort results in about 474 calories burned in an hour for a 190-pound individual. This person can burn around 906 calories riding vigorously for an hour. Even if you ride a stationary bike several days a week, data from the National Weight Control Registry shows that people seldom have weight-loss success without also addressing their diet. You can improve your diet in many ways, but the constant should be cutting calories. Drink water instead of other beverages, snack on vegetables between meals to prevent excessive hunger, serve your meals on smaller plates and limit the meals you eat outside your home. The rate at which you lose weight with the help of a stationary bike depends on how much time you devote to the activity, how many calories you consume daily and how active a lifestyle you lead. If you pedal at a moderate pace, plan to spend 300 minutes per week on the bike. If you can maintain a vigorous speed, however, closer to 150 minutes can be enough to lose weight. Knowing the recommended calorie intake for your demographic is also key. A 30-year-old woman with a sedentary lifestyle should consume close to 2,000 calories per day, for example. 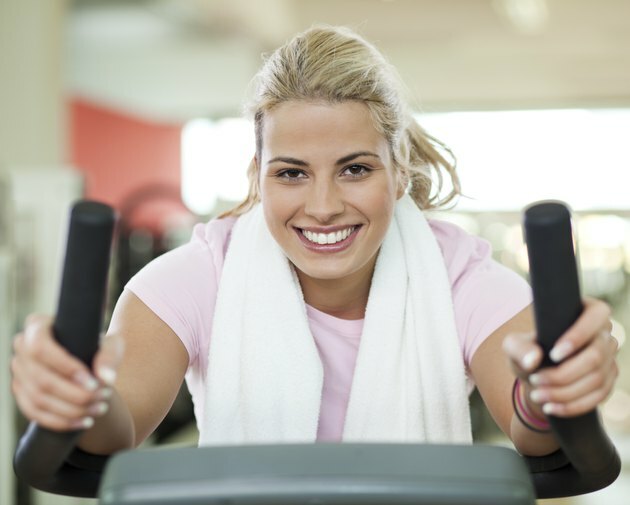 If this woman keeps her calorie consumption below this guideline, uses the stationary bike regularly and keeps active as much as possible, she will typically begin to lose weight. What Is the Lowest Amount of Calories for a Woman Trying to Lose Weight? How Many Miles to Ride a Bike to Lose Weight? How Long Should I Row to Lose Weight?